Lauren Beukes first came to my attention thanks to William Gibson or maybe Cory Doctorow. Some great author who recommended her on Twitter. I picked up her first two books, Moxyland and Zoo City, and read Moxyland a few years ago. I liked it, but it definitely felt like Gibson’s sensibility filtered through a South African setting. On the other hand, The Shining Girls, her third novel and first for Mulholland Books, reads like Beukes striking out on her own and making a name for herself. The result is stunning, harrowing and immensely readable. The Shining Girls follows the interlocking lives of two characters: Curtis Harper, who discovers a mysterious house that lets him travel in time as long as he murders the “shining girls” mapped out on the bedroom wall, and Kirby Mazrachi, one of Harper’s attempted murder victims who manages to survive and devotes her life to tracking him down. We are also treated to heartbreaking vignettes of the women Harper kills throughout the 20th century; every woman he murders is full of endless potential that he snuffs out by torturing them to death and mutilating their bodies. Although time travel is part of the narrative, The Shining Girls feels more like a crime thriller than a scifi story. It helps that the story all takes part in the past – Kirby’s “present day” is the early nineties. The speculative elements exist mostly as plot devices and a way to build tension, and Beukes doesn’t spend much time explaining how Harper is able to do what he does. Beukes has a background in journalism, and it’s clear that a lot of research went into this novel. The women we meet throughout the story span multiple social classes, decades and races, and each one is carefully drawn in the short moments before she dies terribly. My only criticism of the novel is that it feels like Kirby discovers the truth very late in the story, and after that point everything kicks into high gear until the ending. I would have liked to see a bit more of Kirby exploring the strange world of the house and its dangerous inhabitant. If nothing else, Beukes left me wanting more at the end, which is definitely a positive thing. 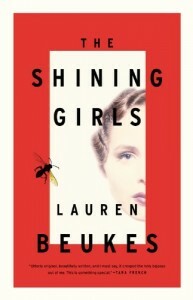 My hope is that The Shining Girls is just the first of Beukes’ forays into crime/thriller writing. It’s a genre that suits her well.